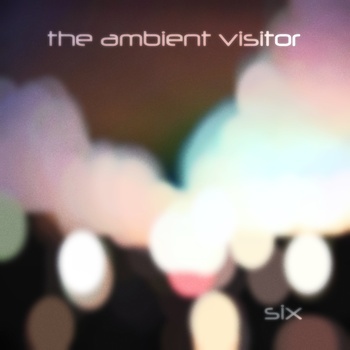 Because my review queue is fairly backlogged, I originally intended to just write about The Ambient Visitor’s recent release, Six, as this is the one I was requested to review. As I got more deeply into the calming, generative flow of it, I went looking for more info on this side project by the man behind Bing Satellites. There I discovered that Seven and Eight had also been released, in February and March of this year, respectively. With my head still delightfully salved and gently undulating from the effects of Six, I decided to take the plunge and go straight on into the remainder of this excellent series. This was a good choice on my part. The concept behind the series is that pieces are built from single notes looped at differing lengths, creating slow waves of change across the space of roughly an hour. The result comes out in calm streams of sound that carry you unhurriedly along. The sounds are warm for the most part, with the occasional chill of a shadow passing overhead. The Visitor clearly doesn’t want to disturb you during your stay. Six is described at the “brightest” of the series; as it was my starting-off point I can’t comment on that other than in comparison to Seven and Eight. Having looped all three in several extended, blissfully time-ignorant sittings, I can’t say I find one more tonally “light” than the others. Each piece has its own stages of brightness and shadow; each is a soft voyage in its own way with very distinct, albeit slow, movement. Seven takes some of its source material from bells, and Eight has its moments of choral pads and the touch of bass–but even so, the series benefits from the fact that one can flow into another, in whatever order, and keep the listener engaged. This is meditation-perfect music, great for low-volume looping and absolutely immersive in headphones. (I recommend going with the ‘phones.) Perhaps the best recommendation I can give is to say that, having heard Six, Seven, and Eight, I’ll be headed back for volumes One through Five. Available from The Ambient Visitor web site.